Why Does The International Space Station Have Such A Weird Shape? I feel like a parent that was just told their child is ugly. As an engineer, I look at the ISS and think "of course it looks that way, why would it look different?" Where a fictional spacecraft has the luxury of having its design dictated by style, real spacecraft are constrained by budget, tradeoffs, and practicality. Every feature of the ISS can be explained by those words. We don't yet have the technology to do construction in space, so we have to assemble a large vehicle in space from launch-able components. At the time of the ISS assembly, the two mechanisms for getting a large payload to space were the Space Shuttle Orbiter and the Russian Proton rocket. Those two sentences explain a lot of the ISS appearance. It had to be assembled from pieces that would fit in the Orbiter payload bay or the payload fairing of a Proton rocket. This dictates a maximum length and diameter for each component. We can therefore expect ISS to be composed largely of cylinders, linked together like sausages. Those two delivery vehicles dictate other characteristics. The Space Shuttle Orbiter could deliver a completely unpowered cylinder, remove it from the payload bay and attach it using the robotic arm and attach it to the ISS. But, the Russian Proton rocket deposits its payload in low Earth orbit and that payload then has to fly itself to the ISS. A space station with multiple labs operating at all times needs a lot of electrical power (a few kilowatts). That's going to require big solar arrays — enough to almost fill a football field. And because the angle to the sun changes as the vehicle orbits the Earth, those solar arrays need to be able to rotate so that they constantly face the sun. That dictates that those solar arrays need to have unobstructed paths — unobstructed not just in their rotation, but unobstructed in their line of sight to the sun. So we mount the solar arrays off to the sides and we keep the profile of the rest of the vehicle low. To hold those solar arrays we need rigid structures that can handle the twisting torques of the solar array rotation and drag. That's the big horizontal bar across the vehicle. The trusses are not pressurized modules, but they aren't wasted space. The trusses are full of equipment like batteries and coolant pumps. The ISS needs to stay powered during night passes, so several very large batteries are needed. Now that we've accepted that our space station is going to be a series of linked cylinders, we might wonder how they would be arranged. 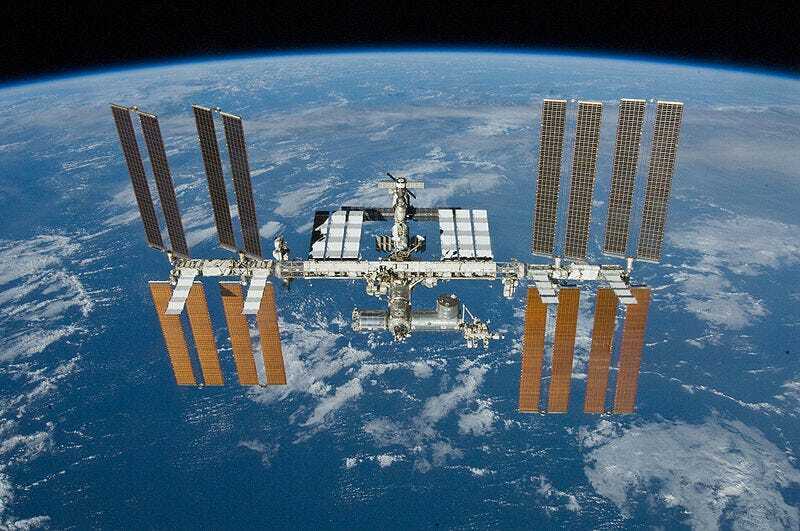 It took several years to assemble the ISS. It needed to be a functioning and occupied vehicle during that time. That puts restrictions on where components are put. We need to have stable attitude control of the stack and we need to have power, data, and consumables connectivity. We need to have unobstructed paths for docking vehicles along the v-bar (velocity vector) and r-bar (orbital radius vector). We need to be able to reach all of the berthing ports with the robotic arm. We can't block communications antennae. The GPS antennae need a clear path to the satellites. The ISS is all about function over form. When I watch science fiction, I find myself looking at the smooth, uniform, symmetrical ships and asking myself questions like "How do they reject heat? Where are they getting their electrical power? Where are the communications antennae? How does a docking vehicle avoid pluming? Why did they put the tanks on the inside where they are harder to replace? Why are they using so much more material than needed? Where the heck did they build that thing? And so on." Every little projection, every little change in color, every change in dimension on the ISS is for a explicit engineering reason. Why does the ISS have such a strange shape? originally appeared on Quora. You can follow Quora on Twitter, Facebook, and Google+.